The best fudgy chocolate brownie with white chocolate chunks. 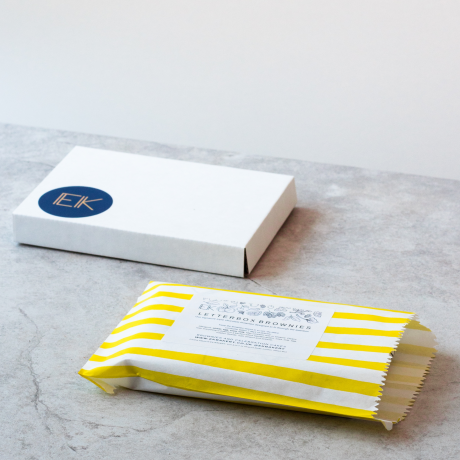 Two large brownies per box, beautifully wrapped in printed greaseproof paper with the option to add a handwritten gift message on a notecard. These brownies are letterbox friendly so can be delivered at any time. We send all parcels with standard 1st class post. Please note, slecting next day delivery will add tracking and will require a signature on arrival. We send orders on Tuesdays and Thursdays. We need 24h notice before dispatching your order. Please do get in touch if you need it sooner and we'll be happy to help. Handmade with quality ingredients: British butter and free-range eggs, organic flour, fair trade sugars, chocolate and cocoa. We use Pump Street white chocolate chunks - 44% Ecuador from Hacienda Limon farm. This product is dispatched by EK Bakery. This item has a shipping weight of 400g. This product is eligible for free Standard Delivery (signed for).